Last of the Longnecks explores the plight of giraffes and the implications of their demise in our rapidly changing world. 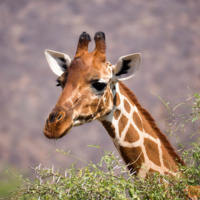 The film follows top scientists, wildlife conservationists, and anti-poachers from Africa to Europe to America to shed light on the giraffe’s struggle, celebrate what makes these majestic animals so unique and discover what hope can be found in the tangled relationship between humanity and nature. The movie tells a compelling story about how little is actually known about the planet's tallest animal and how close they are to becoming extinct. Sponsored by Speak Out for Species and the UGA Office of Sustainability as part of the Animal Voices Film Festival.